The crew of the Scorpion submarine were trained in the school of Charlie Spritz. Below are some memories of “Spritz Navy”. An average of 9 out of every 107 applicants were accepted for two weeks of preliminary testing at the Navy’s National Submarine Training School in New London. Connecticut. (I) Of that select group of nine, 25 to 30% were rejected before the program began, based upon tests given to determine who was physically and mentally fit for submarine duty. (2) Vision tests (night vision being crucial) were first to be passed. Finally, there were many physically demanding tests. One was enduring 55 pounds of pressure (three times that of sea level) in a tiny chamber designed to simulate a submarine at a depth of 100 feet, amid a sizzling 130 degrees. Glistening with sweat, the men would swallow hard, popping their ears. The heat made breathing difficult, increasing the psychological strain. Any sign of panic or undue stress, led to failure. The last and one of the most rigorously stressful of the physical tests was a 100’ ascent from the bottom of the submarine escape towcr, (where two voluntccrs had died) involving thc disciplined and proper use of the “Momsen Lung”. The “water works tests” caused many not to be selected when they exhibited signs of panic or lack of discipline. 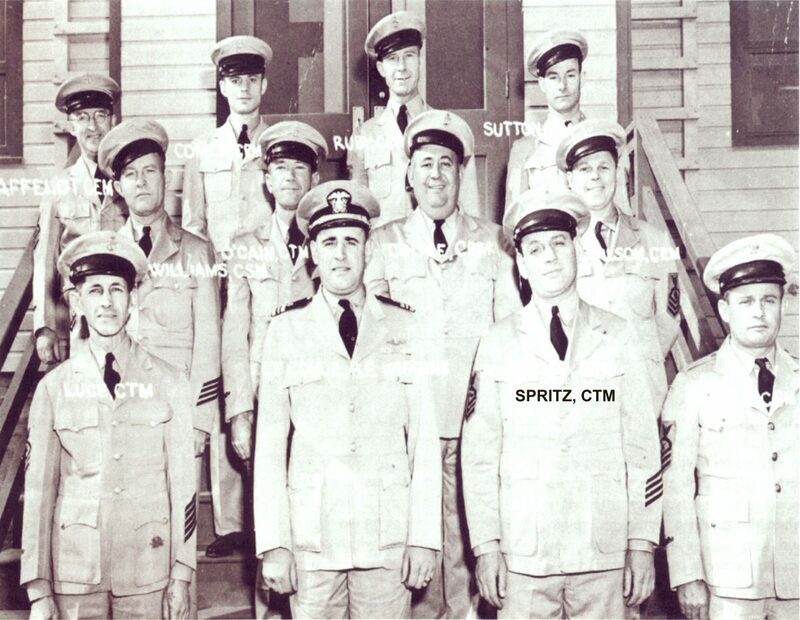 Before the war, only 200 were enrolled at the Submarine School at any given time. He never married, didn’t drink, didn’t smoke, and he devoted his life to governing the daily routines of the trainees and other CPO instructors themselves mostly 20 year veterans of deep sea diving and submarines. Many were convinced that he had gone a little crazy alter a deep-sea diving accident in the 1930s, and it seems he was universally hated for his constant haranguing and punishments dealt for the slightest infractions of rules. Lloyd Charles McKenzie, a veteran of the U.S.S. Stewart (DD-224) in the Asiatic Navy, graduated third in his class, of 18 men, from Chief Sprilz’s Submarine School in New London, April 15, 1940. He was assigned to the U.S.S. TRITON, a new class of U.S. submarine with many annotations, becoming a member of her initial crew. After her commissioning in August, 1940, TRITON was transferred to the Pacific to be in the forefront of the Navy’s defense efforts before the attack on Pearl Harbor. He remained with TRiTON, part of her battle-wise crew, until she fell to depth charges in combat with three Japanese destroyers on her sixth war patrol, March 15, 1943. TRITON and crew rest at a depth of 18,000 feet. in the Pacific. in the Caroline Basin, north of the island of New Guinea. U.S.S. TRITON is credited with having destroyed 18 ships of the Japanese Empire and damaging 6 others before her loss. (6) TRITON is also credited as being the first United States submarine to sink a Japanese ship by deck gun in World War II. Lloyd McKenzie was “first loader” of that deck gun crew. According to a living surviving TRITON shipmate who was not assigned to TRITON’s final war patrol, Lloyd McKenzie was promoted to Chief Torpedoman, and thrown into the Brisbane River as part of his initiation to TMC, two days before the departure for that fatal sixth war patrol. No official U.S. Navy record of his promotion to TMC has ever been found. Lloyd McKenzie is one of 3617 submarine shipmates, on 52 U.S. submarines, from World War II, who remain on eternal patrol. They are in the unending line of patriots that have defended our nation with their lives so that we might live in a free country. Americans must always remember that our Freedom has not been established without an extremely high cost. Their resting places are known only to the almighty. (1) Torpedoman, Ron Smith, U.S.S. Seal, SS-183, 1990. (2) United States Submarine Memorial and Library, Groton, Connecticut, 1995. (3) Back From the Deep, Carl LAVO, U.S. Naval Institute Press, Annapolis, Maryland, p. viii, pp 11-24, 1994. (4) Victory at Sea - The Submarine, The Ridge Press, Incorporated, New York, New York, p. 23, pp 57-58, 1959. (5) Navy & Marine Corps World War H Commemorative Committee Report, Summer 1995, p. 13. (6) U.S. Submarine Attacks During World War II, John 0. Alden, United States Naval Institute Press, 1989. EMBERS OF faded memories glow anew whenever those congregate who served in the United States Submarine Service during World War II, inevitably the talk turns to New London, Conn.. and “Spritz’ Navy”. Spritz’ Navy, a navy within the U.S. Navy, ranked among the most unusual in seafaring annals, it never put to sea, It never fired a shot, it offered about as much romance as a bowl of cold mush, and was commanded with an autocracy approaching despotism by a chief petty officer--a non-commissioned enlisted man. Yet, Spritz’ Navy represented one of the finest assemblages of fighting men in the world, holding forth on American submarines beneath the swells of the Pacific from Honshu to Singapore and Cutch Harbor to Australia. (Charley) Spritz was responsible for indoctrinating, approving and assembling more than 20,000 enlisted men into classes for submarine schooling. My introduction to the skipper of Spritz Navy occurred in early summer 1944. I was a 17-year-old seaman, and, like all others who serve in submarines, had volunteered for duty, passed preliminary physical and psychological tests, and was sent with 11 others for schooling to the U.S. Submarine Base at New London. None of us knew Spritz. And none of us was aware of Spritz’ Navy until the driver of the Navy bus that met us at the train in New London to take us to the base referred to it wryly, but with a trace of empathy. Before the bus had rolled to a stop in front of the base administration building, a stern-faced chief petty officer in his early 50s seemed to materialize on the landing in the bus doorway and a raspy, guttural bellow echoed the length of the nearly empty vehicle. No one had to introduce us. We knew we had just made Spritz’ acquaintance. We stood at attention while Spritz walked the length of the line, stopping before each man and eyeing him from white hat to shoe soles. Occasionally. he turned and spoke to a yeoman second class, who was to be ever-present with his paper-filled clipboard during our tour of duty in Spritz’s Navy, always standing a pace behind the chief, like a shadow. he wore so many hash marks they mode me think of a gold picket fence. The emblems of the master deep sea diver and ordnance specialist were neatly flat stitched on his uniform along with the twin dolphins and conning tower insignia of the qualified submariner. Oddly, he displayed no service ribbons. With the exactness of a submerged approach of an enemy target, Spritz outlined his commandments. They were to be observed to the letter. From that moment we knew we would have to work our way out of Spritz’ Navy. We were to be clean-shaven and wear regulation haircuts, spit-shined shoes, clean dungarees, dress blues and whites. Bunks were to be mode properly and there was to be no stray gear. Each morning before quarters and colors, Spritz inspected all personnel and barracks. We also discovered that before we were to be admitted to submarine school we would be subjected to extensive individual and collective psychological, aptitude, and physical testing, underwater escape training, and demonstrating our ability to endure the pressure and closeness of the compression chamber. When we weren’t engaged in testing at various intervals during the day, we were assigned to work details collecting garbage, cleaning grease traps, polishing barracks GI cans with steel wool and other chores of lesser allure. base. One man would fall out and count cadence while his companions marched. Talking and smoking absolutely were forbidden while assigned to a working party. Liberty was granted one day a week, either Saturday or Sunday, contingent on passing Spritz’ inspection and no recorded infractians of his rules. A broken eommandment meant restriction and extra duty. Extra duty meant not only additional work assignments after regular working hours, but removing all your gear from your locker, stowing it properly in your seabag and reporting to an isolated barracks in which all the light bulbs were blue. Appropriately, the barracks was known as the “Blue Room.” A bunk was assigned, gear stowed and roll call was held on the hour throughout the night. A half-hour before regular 5 a.m. reveille. “Blue Roam” guests were awakened to return to their own barracks, restow their gear in their lockers and make ready for Spritz’ personal inspection before the normal work day began. “There’s room for anything on a submarine -- except a mistake," Spritz admonished at every opportunity. The admonition also was posted in bold black letters on signs in every classroom. Yet, there was another side to the commander of Spritz’ Navy. The salty old chief, who then had served in submarines 24 of the 32 years he had been in the Navy, also doubled as father confessor to many and intermediary between enlisted men and commissioned officers. When he detected a man he believed might crack under the strain of long patrol, he took him aside, as he did with five among the group with which I arrived at New London, and saw to it that each man returned to his previous surface unit without stigma. Spritz contended he could tell whether or not a man would make a submariner by looking at his neck. If soap and water were in order, Spritz held the man wouldn’t make the grade. Cleanliness, and what it indicated. were prized next to perfection, in his mind. One morning while inspecting those hopefully bound for Saturday liberty. I was directed to step forward. I complied.with that sinking feeling that accompanies being singled out among your peers. “Is that uniform regulation?” Spritz demanded -- and I trembled. “No, sir,” I muttered, groping for an excuse. The base cleaners had misplaced my government issue blues. Rather than spend liberty on the base, I elected to risk standing inspection in new tailor-made bell bottom blues that had cost me the better part of two months pay. I was granted liberty, the incident was closed, and for a fleeting moment I could have sworn I detected a hint of a smile that deepened the road map of wrinkles at the corners of his dark eyes. Spritz contended that those who had learned self-reliance by having to shift for themselves made the best submariners; the worst, those who had been babied at home. His own circumstances undoubtedly contributed to his philosophy and penchant for perfection. A sister, Mrs. Alice Pera of Great Barrington, Mass., was to recall years later that Spritz was "very unhappy” at home and that “the family was concerned about him. He just didn’t seem to fit anywhere. He was a misfit socially, I suppose. Spritz was born in Cincinnati, Ohio, but the family moved soon after to New York City, where he was reared. He was a “very poor student,” and was out of the house at 17” when he joined the Navy with his parents’ consent, Mrs. Pera recalled. That would explain why. despite his autocratic demeanor and unrelenting rules portending perfection, many sensed that he still remembered that he also once was a young submariner making the same blunders we did. Spritz never married. The Navy was his life. He left the base only once a month briefly to visit friends and go to the bank. Yet, those close to him confided that during occasional moments of somber reflection he spoke fondly of an English nurse who was killed during the German V-2 rocket blitz of London. I never again saw Spritz after he came to the barracks where we had been assembled upon completing school and assigned to submarine relief crew duty in the Pacific. He had come to say goodby, wish us well, and in the event we had forgotten within a matter of days, one last time reminded us that, “There’s room for anything aboard a submarine--except a mistake." The letter advised that Chief Tarpedoman’s Mate Charles Spritz. USN (Ret. ), was admitted May 28, 1957 to the U.S. Naval Home in Philadelphia, Pa., and died there Nov. 3. 1970.